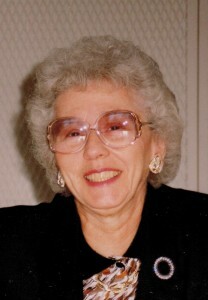 Yolanda Peroski, 83, of Warren, PA died Wednesday, June 27, 2012 in the John and Orpha Blair Hospice Residence. Born February 26, 1929 in Warren to the late Peter and Angela Rose Molinaro, she was a lifelong resident of the area. Yolanda graduated in 1948 from Warren High School and had been employed as a clerk with Crone’s Pharmacy and the former New Process. She enjoyed gardening, cooking and a good game of cards. A devoted mother and homemaker, she loved spending time with her grandchildren and great grandchild. She was a parishioner of St. Joseph R.C. Church. She is survived by her daughter – Marie “Mardi” Logan, of Marysville, WA; three grandchildren – Matthew, Ryan and Jeremy Graves, all of Asheville, NC; and a great grandchild – Marek Graves. In addition to her parents, she was preceded in death by her brothers – Frank and Tony Molinaro. Friends may call the Donald E. Lewis Funeral Home, Inc. on Friday, June 29, 2012 from 6:00 to 8:00PM where a Vigil service will be held at 7:45PM. A Mass of Christian Burial will be conducted at St. Joseph R.C. Church at 10:00AM Saturday, June 30, 2012 with Msgr. John Lucas, Pastor of Holy Redeemer R.C. Church, officiating and Deacon Joseph Lucia assisting. Interment will follow in St. Joseph R.C. Cemetery. I am sorry to read the loss of your Mom. We are always too young to lose our Mother. I remember your Mom from when we attended St. Joe’s together. She was the nicest person, and I always thought you got your sense of style from her.